It’s almost February and that means Valentines day is right around the corner. I love all things Valentine and I am excited to tell you about a free Printable Valentine series that will be running here at Skip to my Lou. That’s right –Starting today and running through Valentines day, Skip to my Lou will be featuring a new and original printable Valentine project for you to download and print. Get your computers ready because I have gathered some of the most creative artist/bloggers and I can’t wait to see what they have come up with. You are sure to find inspiration every day. Welcome Heather from Whipperberry sharing the first printable Valentine project! Typically a heart attack isn’t a very good thing, that is until you see this heart attack! Hello my Skip to My Lou friends, this is Heather from WhipperBerry and I’m thrilled to be here visiting with you today for Cindy’s Valentine’s Day Printable series. My girls have been participating in fun Heart Attack activities for a few years. With just simple hearts cut out and taped onto some unsuspecting friends door. I thought I would kick that idea up a notch and create a printable Heart Attack kit. Print out the hearts, cut them out and write special notes for your friends or loved ones on the back. Cut out the printable hearts and using a glue dot attach a heart shaped candy to the back. 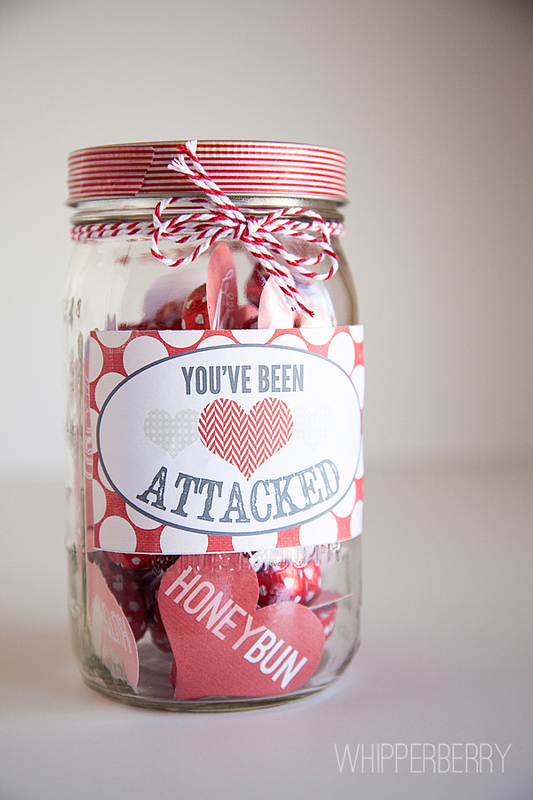 Create a cute jar with your heart attacks inside using the fun printable label that I created. Visit a friend or loved one and use your printable hearts to create a ding dong ditch heart attack by taping all the hearts onto the person’s door. Come on over and say hello! I would LOVE to get to know you all! 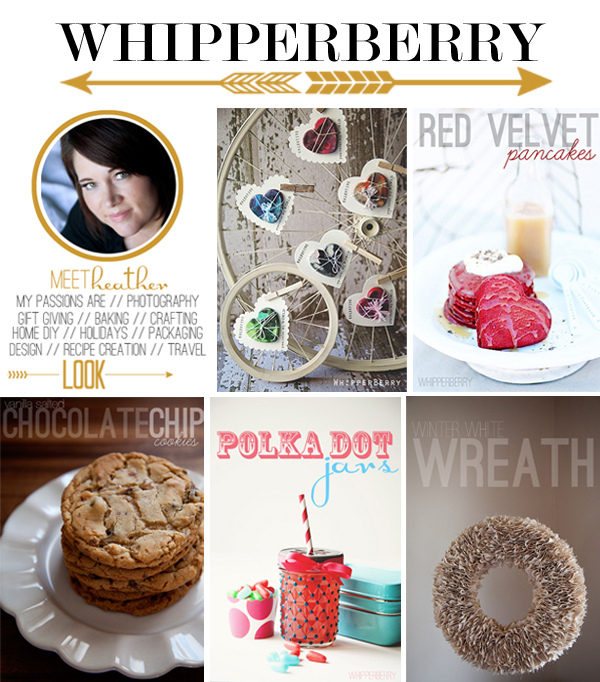 You can find me at WhipperBerry or on Pinterest, Facebook, Twitter or Instagram. 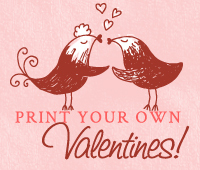 I hope you enjoy these printables and have a fabulous Valentine’s Day!! Thanks Cindy for inviting me over to play today, I think the world of you my friend! I've tried downloading the tags for O fishally tags. I want to use them for an activity in the nursing home where I work. But for whatever reason, it's not printing. Too bad, as it would have been a nice activity for our senior residents. What a fun idea! I printed your label (THANK YOU!) and used my Circut Expression machine to cut out hearts on different colored paper. Then I hand wrote the sentiments on them and attached them to chocolate. When I share what I made on or after Valentine's Day, I'll link back to you so people can see the original idea. :-) Thanks for inspiring me and for the beautiful printables! Just found your site; love it and love this idea! Thanks to both! Such a cute idea!! Thanks for posting. How fun!!! I just saw a cute tute the other day like this w/ a childs bdrm door coated in paper hearts for them when they return from school or wake in the morning. I dont have a youngin in the house anymore but the Hub will get a kick outta this!!! Thank you BOTH!